This article will provide you with a step-by-step explanation on how to connect Picqer with Sendcloud. Click the 'Settings' button in the bottom-left corner and choose the option 'Parcelservices'. Here you manually choose the name for this link, register this as 'Sendcloud'. In the following window install the 'Sendcloud API key' and the 'Sendcloud API secret'. After doing this click the 'Save' button. You can find the Sendcloud API key & Sendcloud API secret in your Sendcloud account. Head to 'Settings' > 'Connected shops'. In the next window of Picqer you are able to choose a name for the profile, this is the name that Picqer will display for this shipment. Now choose 'Shipping method', in this menu you can choose from a list of possible shipping methods Sendcloud offers. When you have successfully added the profile you will get an overview of the parcel service. The Sendcloud-link is now added to this list. If you would like to add more shipping-profiles (For example; if you use both PostNL and DHL), you are able to do this. When clicking on the '+shipping-profile' in the top-right corner you will get the option to add extra profiles. After connecting Sendcloud, you will be able to create new shipments in Picqer. When you are in a 'Picklist' and you have picked the products, you will see a 'tick-symbol' in the top-left corner at 'Pick products'. This can be seen in the image below. Here you are able to choose which profile to use to create a shipment. The weight of the shipment has already been completed on the basis of the productdata, you can also manually adjust this. Not every parcelservice obliges you to mention the weight, however, you have to complete the 'weight' box to be able to complete a shipment. When you completed the previous steps click 'create shipment'. As an example you can see a shipment created via Sendcloud. 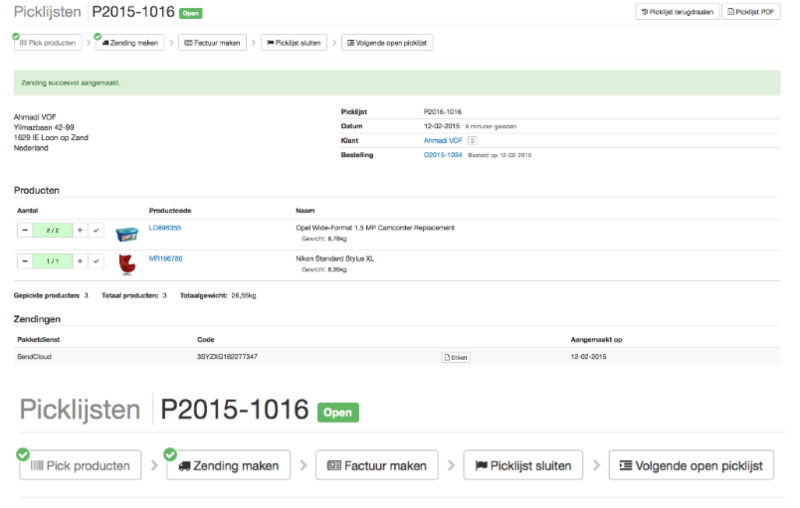 In the image below you can see that the shipment has been created for the order (picklist). The track&trace-code is added in to the 'picklist' in Picqer and the shipment label is available in Picqer, you can find this label by pressing the 'Etiket'-button. You will see that the button 'Create shipment' has received a checked box, this tick-mark indicates that this step has been completed. You can generate multiple labels per picklist.